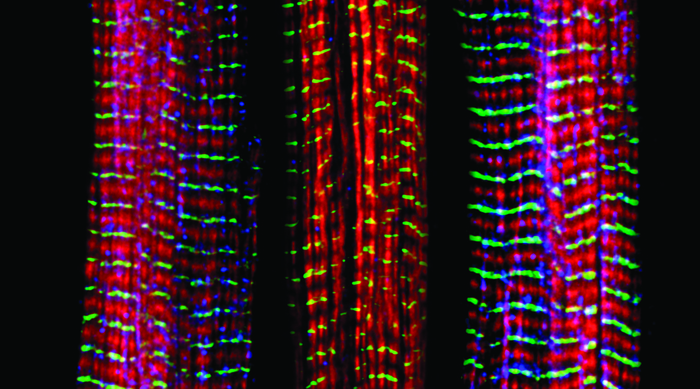 Three muscle fibers; the middle has a defect found in some neuromuscular diseases Of the three muscle fibers shown here, the one on the right and the one on the left are normal. The middle fiber is deficient a large protein called nebulin (blue). Nebulin plays a number of roles in the structure and function of muscles, and its absence is associated with certain neuromuscular disorders. Credit: Christopher Pappas and Carol Gregorio, University of Arizona via Flickr. Strong muscles aren’t important only for athletes—declining skeletal muscle strength is strongly associated with lower quality of life and even mortality in older adults. As the world’s population ages, understanding why muscle strength decreases over our lifespans is critical to ensuring seniors enjoy a happy, healthy old age. Normally, a muscle contracts when calcium is released from a part of a muscle cell called the sarcoplasmic reticulum, but this process sometimes breaks down with age. A protein called ryanodine receptor isoform 1 (RyR1) is responsible for releasing the calcium, and in the May issue of G3, Baines et al. provide support for prior suggestions that many muscle problems that increase with age are due to dysfunctional RyR1 and provide a model system for understanding conditions associated with certain RyR1 variants. Previously, researchers showed that the ryanodine receptor in mice becomes leakier with age, releasing calcium inappropriately. In humans, single base pair variants of the RYR1 gene increase the risk for malignant hyperthermia (MH), a potentially fatal condition in which extreme muscle contractions lead to dangerously elevated body temperature. MH is triggered by anesthetic administration in between 1 in 5,000 and 1 in 100,000 surgical procedures involving general anesthesia, so understanding the ryanodine receptor has broader importance beyond weakness caused by aging. Unfortunately, the human ryanodine receptor has proven difficult to study—it’s a massive, tetrameric protein with more than 5000 amino acid residues per monomer, and the layout of the gene itself makes it difficult to work with. Fortunately, the nematode worm Caenorhabditis elegans carries a version of the gene known as unc-68 that is much easier to manipulate. The short lifespan of C. elegans makes them convenient for aging research, which is why Baines et al. turned to these worms to better understand the ryanodine receptor’s role in muscle function and aging. Their research revealed that human RYR1 variants that increase the risk of muscular problems (including MH) have parallel effects in C. elegans. Single point mutations in unc-68 that mimic the disease-associated human variants result in an abnormal muscular response to an inhalational anesthetic. Just as human muscle biopsies taken from individuals with certain RYR1 variants show an abnormal response to caffeine, C. elegans with the corresponding mutations in unc-68 also exhibited muscular problems in response to caffeine. These mutations also reduced the worms’ lifespans. All the unc-68 mutants in the study developed disorganized muscle fibers as they aged, which may have contributed to their shortened lifespans. Overall, Baines et al.’s findings reveal that mutations in this receptor have similar effects in both humans and worms. C. elegans should prove a useful tool in learning more about the abnormal states caused by ryanodine receptor dysfunction in humans, which will be critical for understanding diseases like malignant hyperthermia—and for guaranteeing a better quality of life for seniors. Baines, K.; Ferreira, C.; Hopkins, P.; Shaw, M.; Hope, I. Aging Effects of Caenorhabditis elegans Ryanodine Receptor Variants Corresponding to Human Myopathic Mutations.